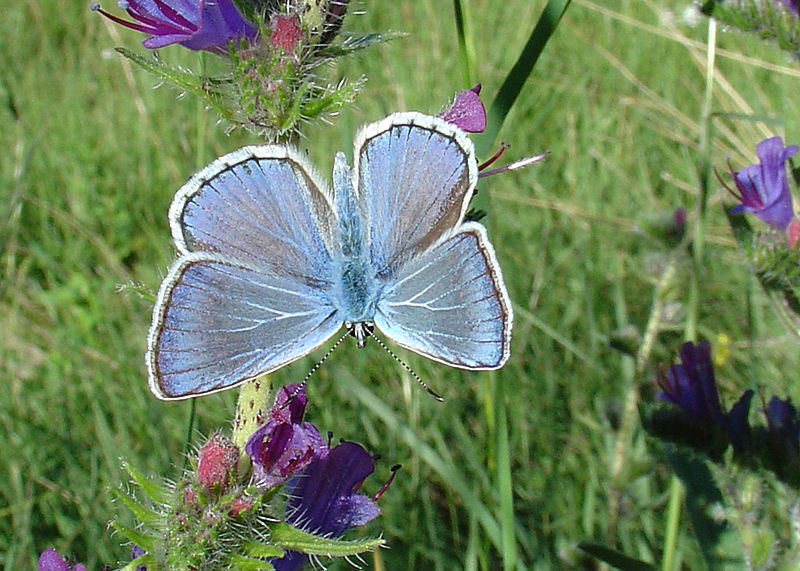 Male of the blue butterfly Polyommatus escheri, a widespread species in Europe. Photo by Eric Sylvestre. Polyommatus is a genus of about 200 species of butterfly found in Eurasia and northernmost Africa with the highest diversity seemingly around west central Asia from Turkey to Iran. It is divided into a number of subgenera (recognised as separate genera by some authors) with the largest, Agrodiaetus, including about 130 species (Wiemers et al. 2010). As the common name 'blue' would suggest, the males of most species are a brighter or paler shade of blue; females are generally brown. Female of Polyommatus semiargus (or Cyaniris semiargus). Photo by James Lindsey. 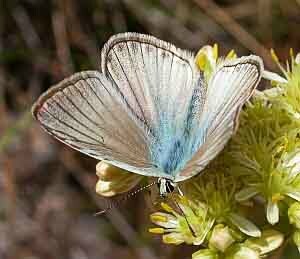 The majority of Polyommatus species lay their eggs on plants of the family Leguminosae. 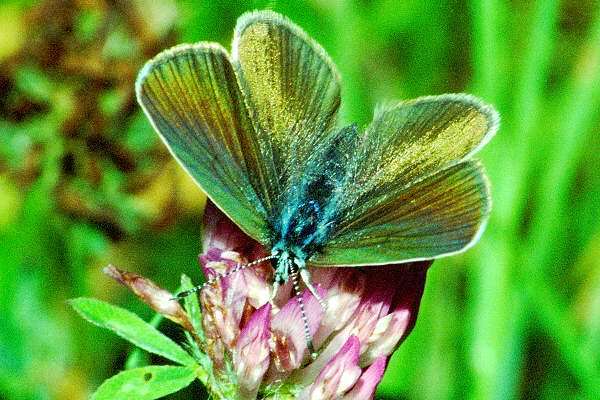 Like many other species of the family Lycaenidae to which they belong, caterpillars of Polyommatus show an association with ants. 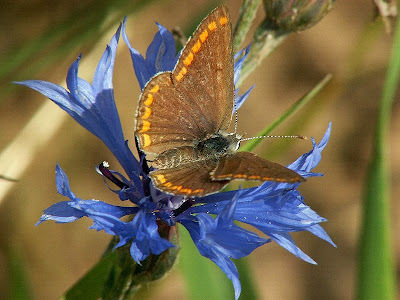 In the species in which this association has been most studied, the common blue P. icarus, the association is facultative only; the caterpillars may reach maturity without ever being tended by ants (other lycaenid species may require tending to survive). Female of Polyommatus agestis. Photo by Hans-Peter. When the caterpillar of Polyommatus icarus reaches its fourth instar, it starts producing honeydew from an organ on its abdomen. It will also produce vibrations that travel through the ground and may attract ants. Arriving ants are presented by the caterpillar with honeydew, in return for which they tend the caterpillar and protect it from predators and parasitoids. The caterpillar also possesses a pair of eversible tentacles on either side of the honeydew organ that it displays when it registers the presence of ants; displaying the tentacles seems to encourage attention from the ants somehow, perhaps by releasing pheromones (Axén et al. 1996). When the caterpillar moults into a chrysalis, the ants bury it under a light covering of soil and leaf litter where it remains until the adult butterfly emerges after two weeks. Polyommatus ainsae (or Agrodiaetus ainsae), an inhabitant of northern Spain. Photo by Teresa Farino. Axén, A. H., O. Leimar & V. Hoffman. 1996. Signalling in a mutualistic interaction. Animal Behaviour 52: 321-333. Wiemers, M., B. V. Stradomsky & D. I. Vodalazhsky. 2010. A molecular phylogeny of Polyommatus s. str. and Plebicula based on mitochondrial COI and nuclear ITS2 sequences (Lepidoptera: Lycaenidae). European Journal of Entomology 107: 325-336.